This mural is painted directly on a wall of a conference room at the Water Science and Engineering Lab at The University of Wisconsin. The theme is the study of water science including biology, hydrology, limnology, and chemistry. 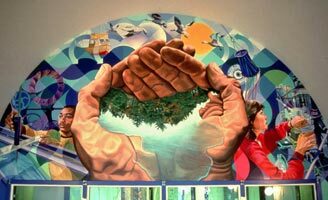 The image of the hands holding water in the shape of Lake Mendota evokes stewardship of water as a vital goal of science. It was funded by the Wisconsin Art Board, through the Percent for Art Program. On this site you will find a comprehensive collection of images that document the works of David Fichter. Not only will you find images of the murals themselves, but also the students, communities, volunteers, and artists that have been involved over the years. Take a look around and feel free to contact me with comments or questions.